Human hands can’t plant trees fast enough to keep up with industrial deforestation. These drones can plant trees 10 times faster at a fraction of the cost. The math is simple. Humans are cutting down 15 billion trees a year and replanting only 9 billion, creating an annual net loss of 6 billion trees. Planting trees by hand is time consuming and expensive, making it difficult to keep up with bulldozers clear-cutting over 40 football fields of trees ever minute. We’ve had impressive efforts, such as India planting 66 million trees in a day, but that was a large-scale event, which required organizing millions of volunteers. It would be difficult to recreate something like that on a regular basis. Luckily, a former NASA engineer has developed drones that can plant 100,000 trees per day each. Multiply that by 165 drones, and we could easily fill the 6-billion-tree gap we face each year. 1. They’re faster. At about one tree per second, they can plant trees ten times as fast as a human could. 2. They’re cheaper. Drones do the job at about 20 percent of the cost of humans, according to the World Economic Forum. 3. They can plant where humans can’t. 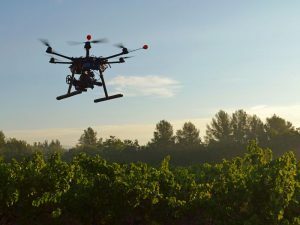 Because there is no heavy machinery involved, drones can plant in hard-to-reach areas that have no roads or steep, inaccessible terrain. 4. They may have higher success/survival rates. When humans scatter seeds, it’s hard to tell how many will actually sprout and grow into trees. The drones use technology to increase the odds, gathering and analyzing all sorts of information, such as surface topology, surface composition, soil type, and moisture in the area, to avoid planting in places seeds would be doomed from the start. First, one drone scans the terrain and develops a 3-D map of the area. The BioCarbon Engineering team uses the map to develop a unique planting pattern. Then, another drone executes the plan, firing germinated seed pods in the perfect locations, at the perfect speed to get them under the soil. Because diversity is key to a thriving forest, the drones plant a variety of species native to the area. CEO Lauren Fletcher calls it “industrial-scale reforestation,” which he says may be the only solution for industrial-scale deforestation.